I just realized I never posted my results from the 3-Day Refresh. Oy vey. So, I’ve now done the Refresh TWICE. The first time, I lost 2.8 pounds. Eh, not bad, almost 1 pound a day. The most recent time that I did it I lost a whopping 4.4. pounds! Now, on a little 5’2” girl like me, that’s pretty significant, right? Again, water weight did not change, so, it’s not like that was all water. The last time that I did the Refresh and lost the 4.4. pounds, I did it after Thanksgiving, so maybe I had a little bit extra to weight to lose (did somebody say turkey?!). I got to say I really love the Refresh. It’s a great way to quickly and safely drop a couple of unwanted pounds. I could definitely see doing this monthly to stay on track. But, I’m actually looking into my next full-body tune up and starting to plan a date for my next Ultimate Reset! I would love for you join me on my journey! Please comment below if you would like to join me. I started the morning with some Les Mills Combat! I think this is one of Beachbody’s most underrated workouts. Everyone talks about Insanity and P90X, and I love those programs, but Combat is pretty incredible. It’s a mixed martial arts program that is great for people of all fitness levels. It’s not THAT hard, it’s a lot of fun, and then at the end, you’re like, “whoa, where did all of that sweat come from? 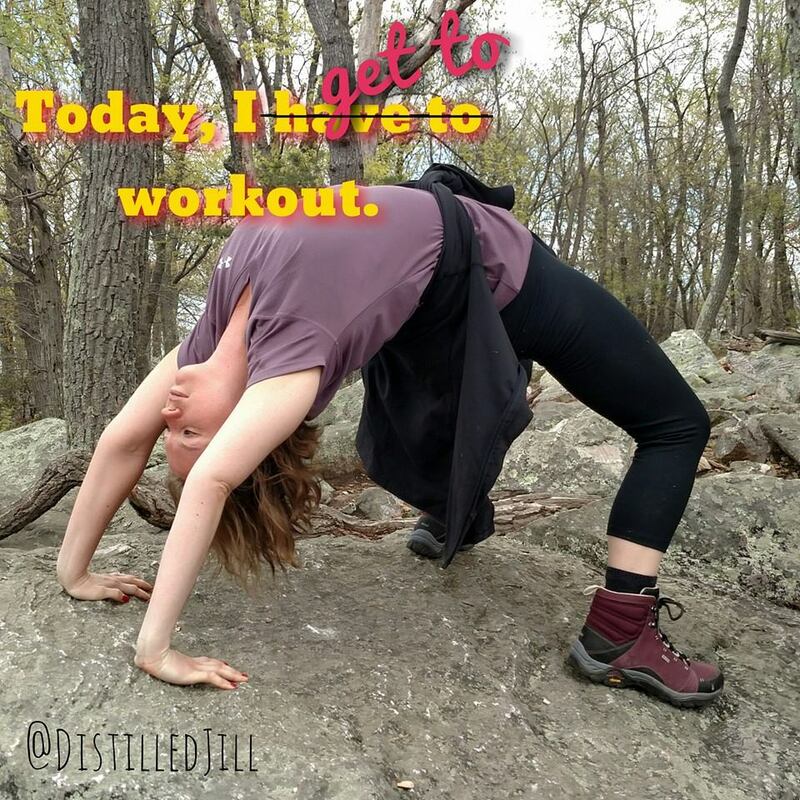 !” I did the 30-minute Kickstart, which I consider to be “moderate” exercise (you’re only supposed to do mild to moderate exercise on the 3-Day Refresh). Then Vegan Chocolate Shakeology with 1/2 banana and water. 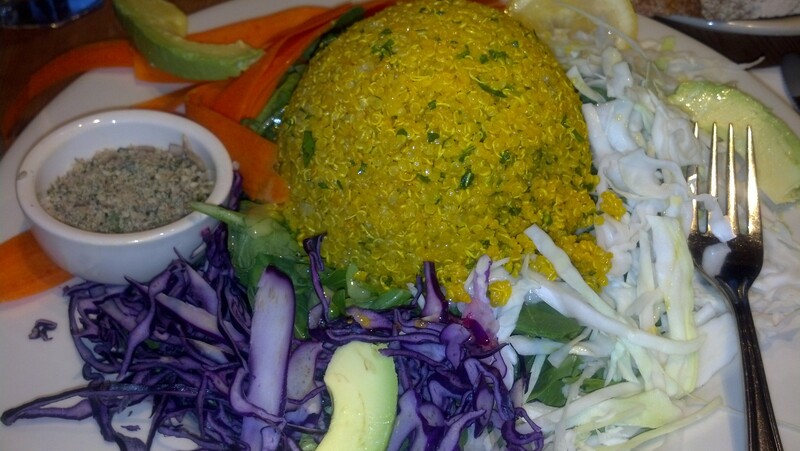 I had some mid-morning detox tea, Fiber Sweep, and then lunch with Vanilla Fresh. The mid-afternoon snack was the same as the past 2 days – hummus, red bell pepper, and baby carrots. 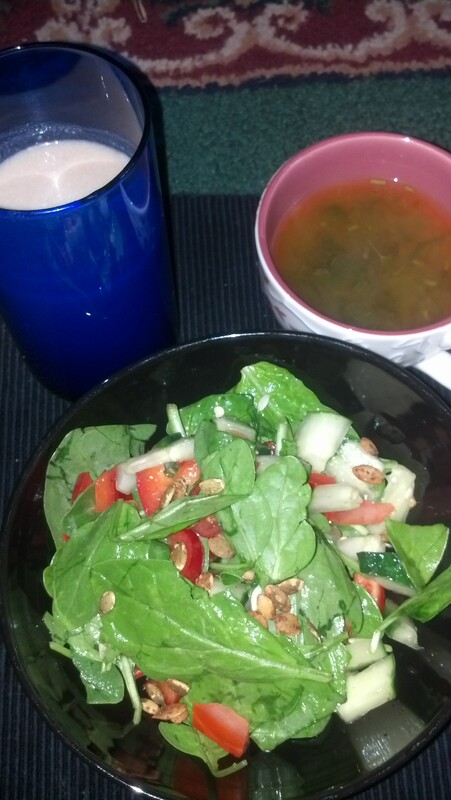 Finally, dinner was the spinach salad from the recipe guide. I couldn’t find sprouts at my local supermarket (I know, crazy, huh?). So, the salad just included spinach, tomato, cucumber, red bell pepper, pumpkin seeds, lemon juice, olive oil, and Himalayan pink. You eat pumpkin seeds a lot during the Ultimate Reset, which I completed 4 months ago, and since then pumpkin seeds have become one of my favorite snacks. The recipe actually made a lot of salad, and not all of it is pictured below. I also had the Vanilla Fresh and the optional organic vegetable broth with fresh parsley. Excited to see what kind of results I have tomorrow! 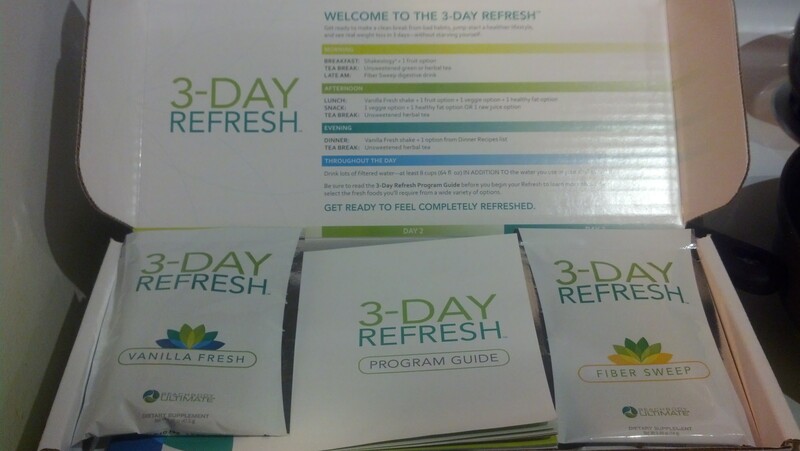 I just completed day 2 of the 3-Day Refresh! I’m actually feeling better than I did yesterday. On day 1, I felt hungrier. Today I changed some of the foods that I ate and engaged in a lighter workout, and today was a breeze! This morning started with a glass of filtered water, followed by an Insanity Cardio Recovery workout. Since I felt hungry yesterday, I wanted to burn less calories in the morning so I could have more stamina to make it through the day. 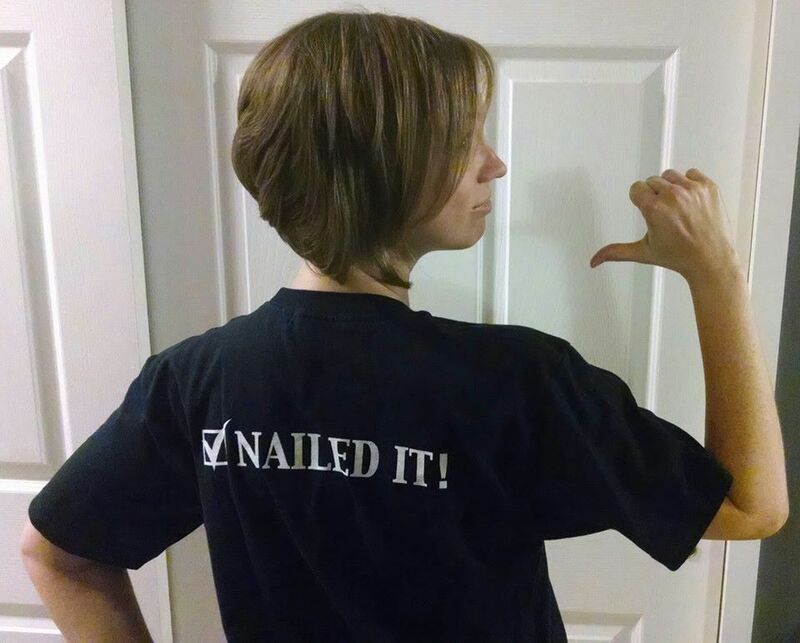 So, I did Cardio Recovery, which is a lot of stretching and yoga-like exercises. The workout was followed by Vegan Chocolate Shakeology blended with 1/2 banana and filtered water. Since I wasn’t feeling too hungry this morning, I went for some tea, which is optional. Since you have to wait 1 hour between each thing that you consume, I wasn’t too thrilled with the morning tea yesterday because it meant 1 less hour until lunch, but today was fine. Then Fiber Sweep. Then lunch. 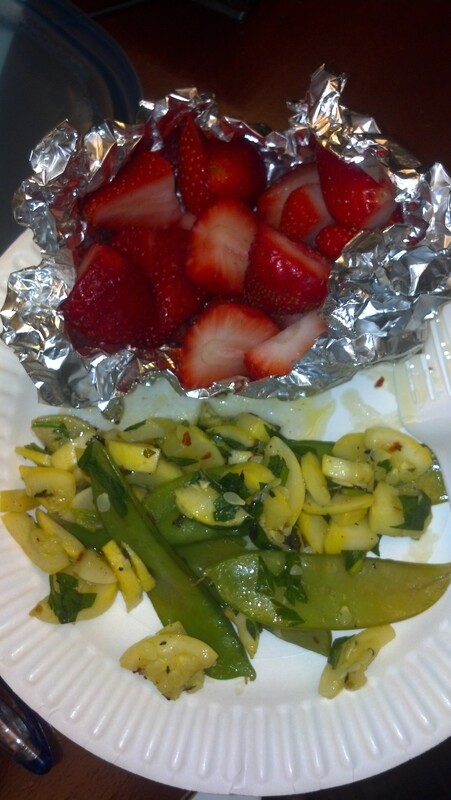 For lunch, I had some farmer’s market fruits and veggies! 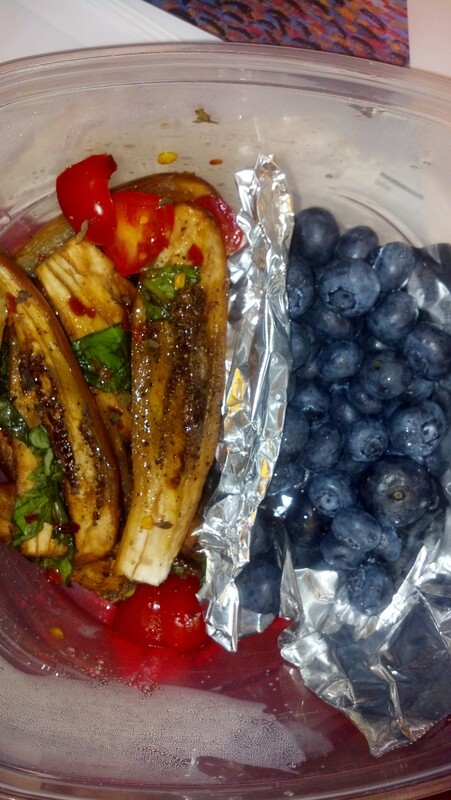 1 vegetable = 3/4 cup cute little baby eggplants with 2 cherry tomatoes (so I went over the veg serving just a smidge). Guilt-Free Seasoning = Himalayan pink salt, black pepper, crushed red pepper, basil, oregano. I baked the eggplant in the oven at 250 degrees for about 20 minutes. This was a wonderful lunch and, with the Vanilla Fresh shake, a surprisingly filling one. I had the same afternoon snack today that I had yesterday (and I’ll have the same one tomorrow too!) – 1/2 red bell pepper, 2 baby carrots, and 2 tablespoons of hummus. I split the vegetable serving in half to have some more variety. 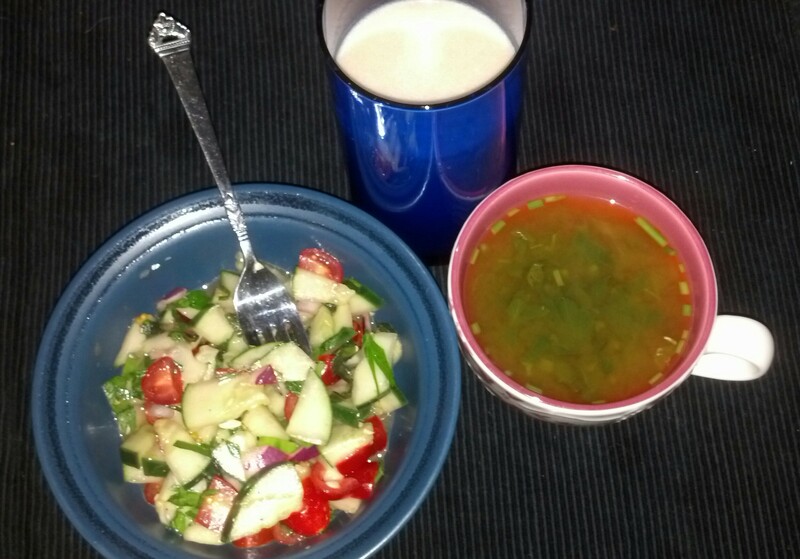 Finally, dinner tonight was the cucumber and tomato salad, which was very refreshing and super easy! This recipe actually made a lot of food for me. I also went for the optional organic vegetable broth with fresh chopped cilantro and parsley. The broth is awesome; I think it really helps fill you up. And, of course, the Vanilla Fresh shake! 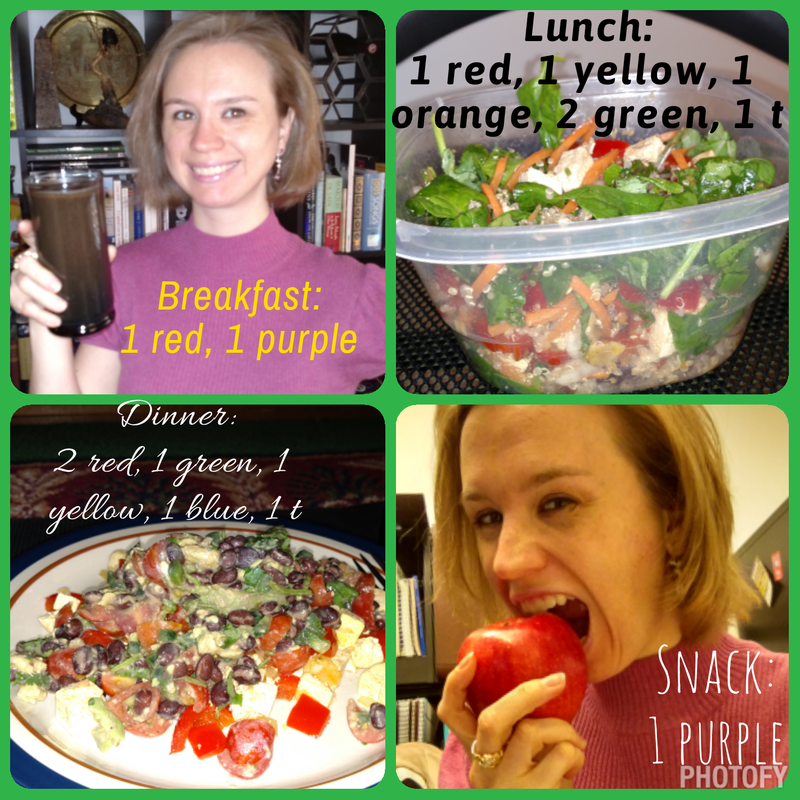 I have to admit that I am having a little fun with the 3-Day Refresh – trying to plan out my meals and decide how to combine the fats, veggies, and fruits. Unlike the Ultimate Reset, the recipes and meals are not predetermined for you day by day. You get to be creative for lunch and the afternoon snack. As this day comes to a close, I’m feeling fine – not feeling anything unusual, good or bad. Though, I did sleep incredibly well last night! I’m usually a pretty deep, easy sleeper, but last night’s sleep was amazing! Looking forward to the final day of the cleanse tomorrow! I’m no stranger to cleanses. 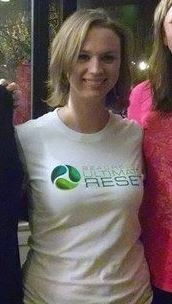 Four months ago, I completed the Beachbody Ultimate Reset, which is a 21-day total body tune-up. 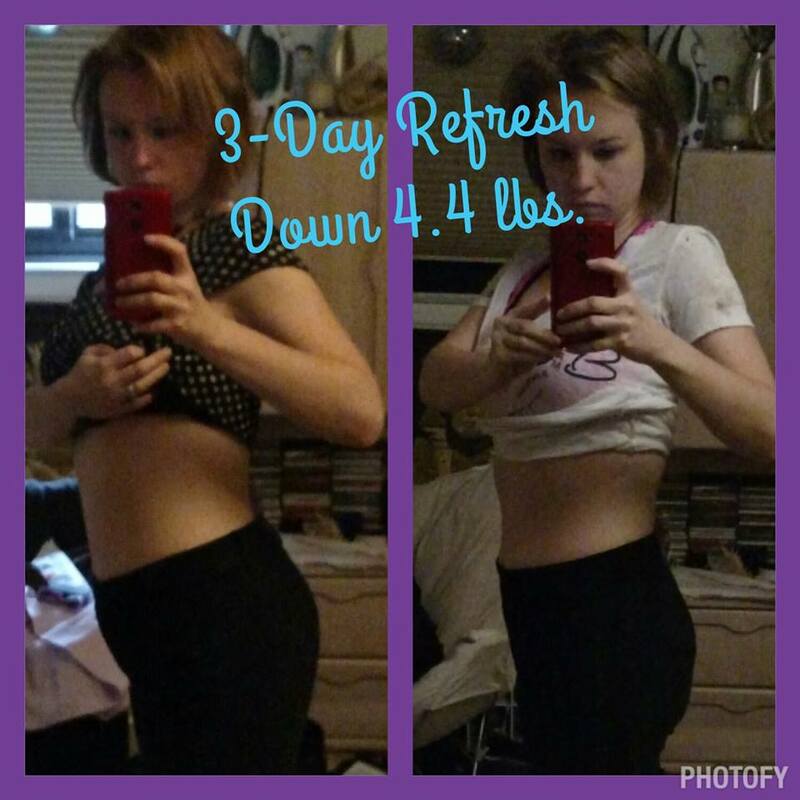 It rocked my world, changed my outlook on what I put in my body, and now I’ve come to conquer the newest cleanse that Beachbody has to offer – the 3-Day Refresh (3DR). 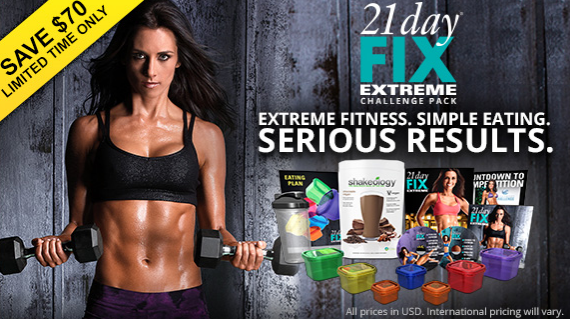 Beachbody was inspired to do a 3-Day Refresh when they saw a coach had essentially made their own 3-day Shakeology cleanse. It consisted of 3 days of Shakeology for breakfast and lunch, a dinner salad with a lean protein (like chicken, fish, or tofu), and green tea. Well, Beachbody got word of this cleanse, saw that there was a market for a 3-day quick fix (rather than the pretty intense Ultimate Reset), but saw that they could improve upon the Shakeology cleanse. How? By adding more protein and fiber to keep you feeling full (I remember getting a little exhausted and irritable on the Shakeology cleanse) and giving you better food options to provide you with a more complete vision of nutrition. 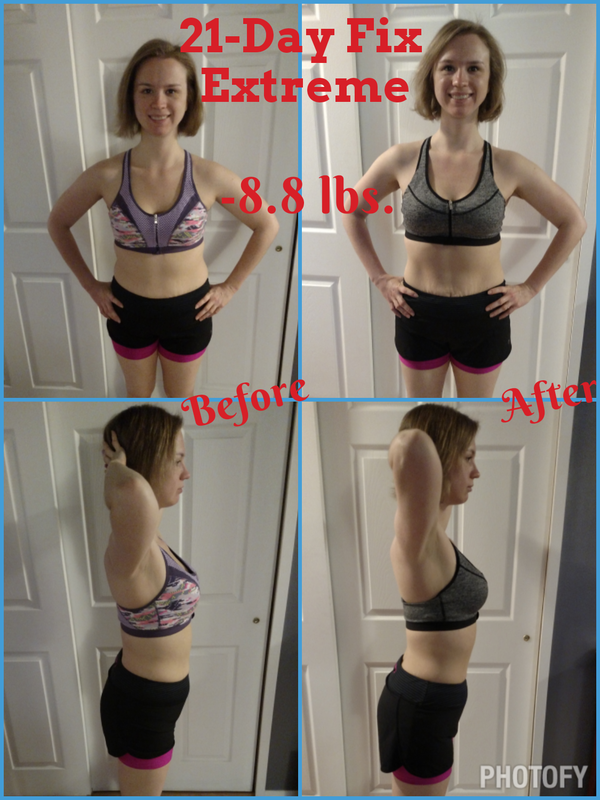 Beachbody wanted to make a fast, clean, and healthy way to drop a few pounds quickly, break free of bad habits, jump start a new clean-eating diet or fitness regimen. In walked the 3-Day Refresh. The 3-Day Refresh kit includes a program guide with recipes, lists of acceptable food options, and 3 days worth of the Vanilla Fresh shake (high-protein, hunger-satisfying shake), Fiber Sweep (digestive health drink), and Shakeology (daily dose of dense nutrition shake). Having completed the Ultimate Reset not too long ago and acing it with flying colors, I thought how hard could the 3-Day Refresh really be? This is my story. The format for the 3 days is essentially the same. First thing that you do upon waking is drink 8-10 ounces of filtered water to help get your system going. For folks familiar with the Ultimate Reset, I’d like to point out a difference here. Unlike the Ultimate Reset, where you are only permitted to drink distilled water, during the 3DR you can have filtered. So, if you have a Brita, for example, you’re good. Then I worked out. I probably worked out more than I should have. The program guide for the 3DR says that you should only engage in “mild to moderate exercise” so that your body can use your energy more effectively to help clean up your system without needing to repair muscle. Well, so what if I consider Core Cardio and Balance from Insanity “moderate” exercise? To each their own, right? For breakfast, I had Chocolate Vegan Shakeology like I do every morning. But instead of blending it with almond milk, a banana, and peanut butter, I had to just stick with 1/2 banana and 1 1/4 cups of water. Then it felt like a long morning. Drinking tea is optional during the 3DR, and I decided to have a cup, which you can have at least 1 hour after breakfast. You’re not supposed to have caffeine, but green tea is permitted if necessary. I had some decaf herbal detox lemongrass tea. An hour after the mid-morning tea, you can have the Fiber Sweep. Fiber Sweep contains soluble and insoluble fibers from whole-ground flax, chia, and psyllium seed husks to naturally and gently eliminate waste from the digestive system while supporting healthy intestinal flora. You mix a packet of the Fiber Sweep with 1 cup of filtered water and drink it. For those who have done the Ultimate Reset, this drink is similar to the Detox supplement from week 2, but it tastes less lemony, is a bit less gritty, a little thicker, and goes down a bit easier than Detox. After taking my Fiber Sweep, I was counting down the minutes to lunch. In other words, I was getting hungry. In the future, so I can eat lunch earlier, I might skip the morning tea. Lunch includes one Vanilla Fresh shake and then actual food! Yes, this is only a short cleanse, but you do get to eat real food on it, unlike some other cleanses, where you drown yourself in high-sugar, low-protein juices. Vanilla Fresh is a high-protein shake (contains 20 grams of protein) to satisfy hunger and deliver essential nutrition needed for healthy weight loss. Since I was in the office at lunch time, stranded without a blender, I shook up the Vanilla Fresh powder in 1 1/4 cups of filtered water. It wasn’t bad, even with room-temperature water, prepared through a shaker cup. It tasted similar to vanilla Shakeology, though a bit thicker. For lunch, you get to exercise some creativity when it comes to the recipe. You are instructed to have 1 serving of fruit (which you can blend into your Vanilla Fresh if you’re lucky to have a blender around or just eat by itself), 1 serving of vegetables, and 1 serving of healthy fat. There are lists for each of these categories (fruits, veggies, fats) that show the item (e.g., blueberries) and its corresponding serving (e.g., 2/3 cup). Last night, I decided to prepare a salad utilizing each the fruit, veggie, and fat. For the sake of variety, I split the veggie serving in half. 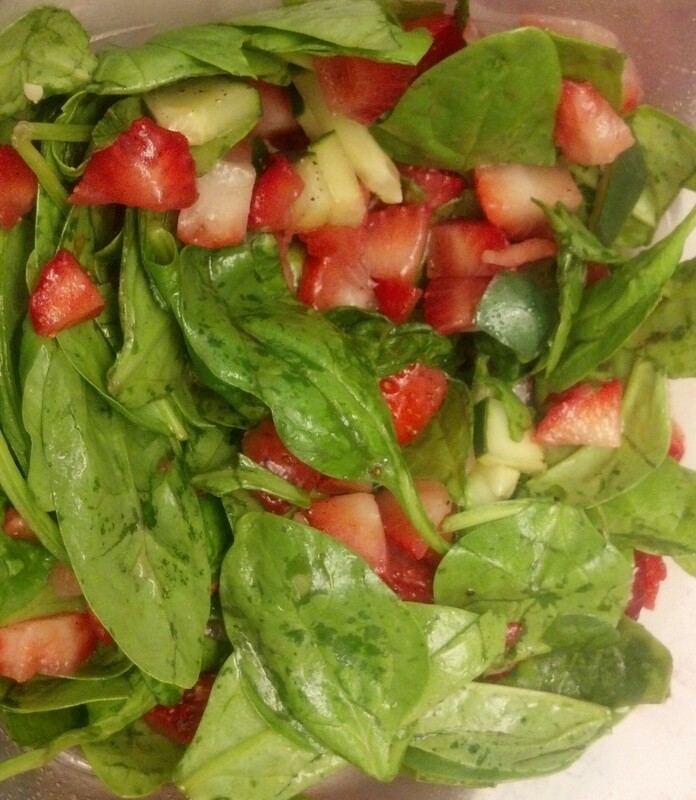 So, I had 1/2 serving of spinach, 1/2 serving of cucumber, 1 serving of strawberries, and 1 serving of olive oil. I also added some flavors from the list of “Guilt-Free Flavorings” included in the program guide, including Himalayan pink salt, basil, and red wine vinegar. At least 1 hour after lunch, you have an afternoon snack. Lunch held me over about 2 hours and 40 minutes before I went for the snack. I probably could’ve held out longer, but I wanted the veggie crunch! Again, the afternoon snack is another exercise in creativity. You are instructed to have 1 serving from the vegetable list and 1 serving from the healthy fats list. Sorry, I forgot to take a photo of this one, but I again split the vegetables for variety and had 1/2 serving of red bell pepper, 1/2 serving of carrots, and 2 tablespoons (i.e., 1 serving) of hummus. I added Himalayan pink salt and ground cayenne pepper to flavor it. An hour after this, I can also choose to have tea if I want, but I didn’t have any today. For dinner, it’s another Vanilla Fresh shake. 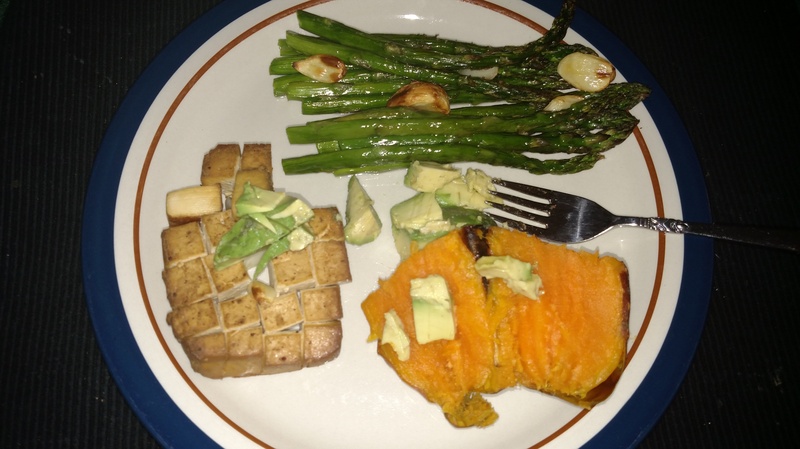 You also are provided a list of dinner recipes (most if not all of them are recipes from the Ultimate Reset, so yippie! low learning curve for me!). You can also add an optional cup of organic vegetable broth with 1/4 cup of chopped fresh herbs. I chose to have the veggie broth with cilantro. For my meal, I chose one of my absolute favorite meals from the Ultimate Reset that was included in the 3DR recipe book – the carrot-seaweed medley! 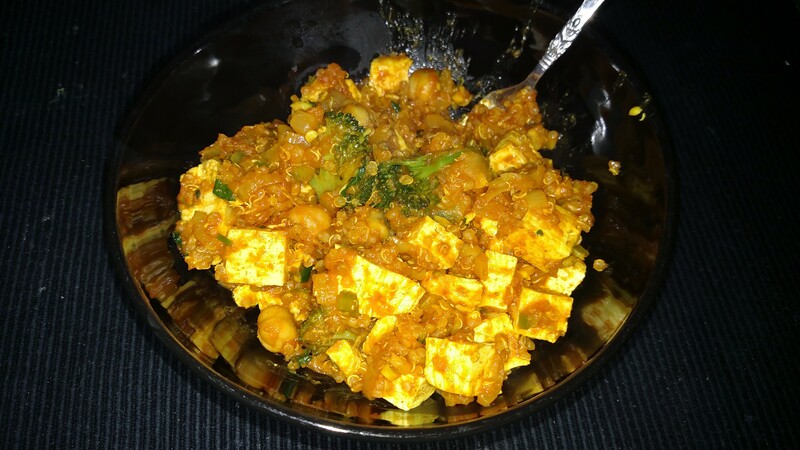 In the 4 months since my Ultimate Reset ended, I had to have made this recipe for dinner at least a dozen times – carrots, edamame, arame seaweed! (Don’t worry, not all of the 3DR recipes are as exotic as this one!) 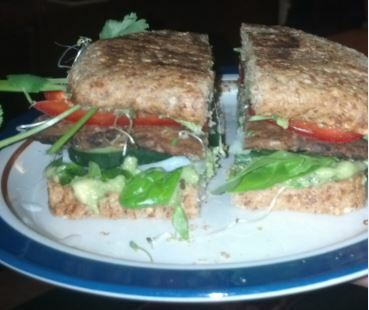 The recipe is not identical to the Ultimate Reset book, but it’s pretty close. The 3DR recipe does not contain Bragg’s Liquid Aminos, for example, and the cook time is actually less, which is a bonus. For tonight’s carrot-seaweed medley, I actually ran out of red bell pepper after making tomorrow’s afternoon snack, so I substituted jalapenos for a nice spicy kick! It’s been probably an hour since dinner ended and that meal really hit me. 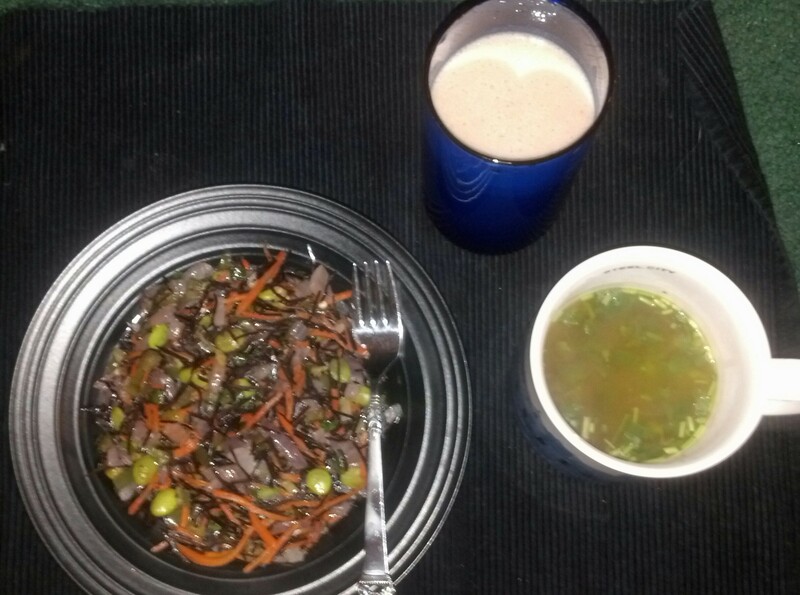 Between the Vanilla Fresh shake (200 calories, mind you), the carrot-seaweed medley, and that big cup of veggie broth, I’m actually pretty stuffed. One obvious difference between the 3DR and the Ultimate Reset is that I actually felt like I ate more food on the Reset and the portions were bigger. With the 3DR, you are consuming so many shakes and getting so many calories that way that you are actually eating less food. I probably prefer eating the calories rather than drinking so many of them, but at least drinking them is less time-consuming. Read some of my old posts about how much time I spent in the grocery store, on food prep, and cooking during the Ultimate Reset, and you’ll see what I mean. You can also choose to end your evening with some optional tea. I just might.